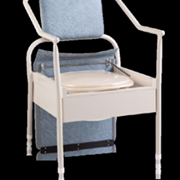 The "GL Range" of shower commodes have proven to be the choice Australia wide with features and options that suit the majority of clients. 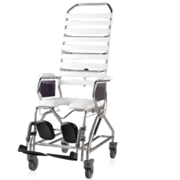 Manufactured here in Australia from long lasting, rust free polished stainless steel, you can have confidence in the quality and relability of the "GL" shower commodes with the company accredited to ISO9001:2000 quality management system. Swing-back arms for side transfers. Wide PVC back strapping spaced so as not to pinch skin. Comfortable waterproof self draining fibre glass or cushion seats (see seat selection). 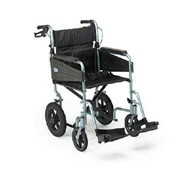 High impact 22" plastic wheel running on stainless steel axles with nylon waterproof bushes and solid rubber tyres. Total locking and standard swivel 125mm (5") castors. 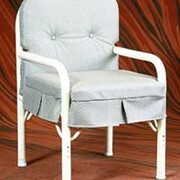 Seat runners to suit pan carrier. Max. recommended user weight 100kgs. 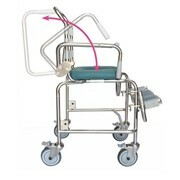 Approximate weight of commode - 16kg. 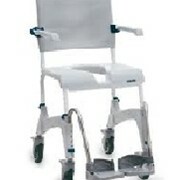 For those wishing to keep their independence, the GL20 has been designed with 22" large rear wheels so the user can self propel themselves to the shower or over the toilet. 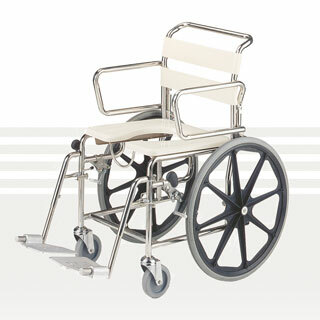 The large rear wheels are fitted with stainless steel axles and solid or pneumatic tyres. 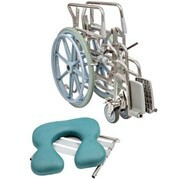 It features a non-folding frame and height adjustable non-removable swing away fooplates. Some customisation is available on these shower commodes please consult your local representative. * Add 30mm to seat height if using padded seat. 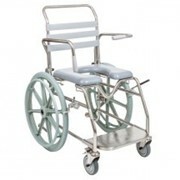 ** Add 30mm to footrest range if using padded seat. ## Deduct 30mm when using padded seat.